Did Ankhesenpaaten Kill King Tut? Background information - In 1968 and 1978 X-ray examinations of the mummy of Tutankhamun revealed that the mummy of King Tut had a mysterious dense spot on the lower back of the skull. This lead to speculation that the young King Tut had been killed, or murdered, by a blow on his head. But did Ankhesenpaaten Kill King Tut? Ankhesenpaaten, the wife of King Tut has been put forward as a prime suspect in the possible murder of King Tut. But who was Ankhesenpaaten and what relationship did she have with the Pharaoh Tutankhamun? 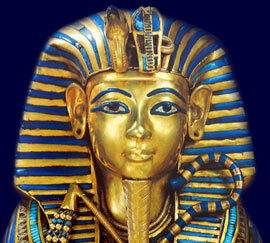 Did Ankhesenpaaten Kill King Tut? - Did Ankhesenpaaten have the Opportunity? As his wife Ankhesenpaaten would have had easy access to Tutankhamun. They would have naturally also had time alone together. Ankhesenpaaten would have had the opportunity to kill King Tut, had she wanted. Did Ankhesenpaaten Kill King Tut? - Did Ankhesenpaaten have a Motive? The images of Tutankhamun and King Tut depict a happy couple. But were these scenes of domestic bliss accurate? Their marriage failed to produce any live, healthy heirs - did Ankhesenpaaten blame her husband for this? King Tut was her half-brother and three years younger, did she resent the marriage which she was pushed into by her ambitious mother Nefertiti? Ankhesenpaaten would have been strongly influenced by her parents Akhenaten and Nefertiti and their belief in the new religion which worshipped the sole god Aten. Did she think that Tutankhamun was weak when pressure pushed him into making compromises regarding the new religion and moving back to the old religion and worshipping all the old gods, the chief of which was the god Amun? During this period even their names were changed from Tutankhaten to Tutankhamun and Ankhesenpaaten to Ankhesenamun. A year after changing their names Tutankhamun, Ankhesenpaaten and the royal court, moved from their home in Amarna back to the old capital at Thebes, the center of worship of Amun and the power base of the Amun priests. We know that Ankhesenpaaten was head strong and as the daughter and wife of a pharaoh used to getting her own way. Did resentment build up in Ankhesenpaaten to such an extent that she would kill Tutankhamun? It looks as if Ankhesenpaaten did have motives for killing King Tut, her husband.